Ancillaries: Clearlight Audio NFT cabling; Silver Arrow cabling and mains leads; KSL LP, Kondo KSL VZ interconnects; Kondo SPC speaker cable and Kondo KSL ACz power cords; Audiomagic Mini Stealth conditioner for digital; Incognito wiring on Conductor and Hadcock 242, Living Voice Mystic Matt, Boston Audio Graphite Matt, Cartridge Man Isolators and setup tools, Dr. Feickert protractor. Graham Tricker's Tron tube amplifiers have had something of a cult following and I was lucky enough to review the Tron Syren preamp with phonostage last year. While Tron is premium product and by no stretch of the imagination cheap, the Syren was quite a special proposition. In particular its phonostage was the only one I've had at home that gave my Tom Evans Groove Plus a run for its money. While the two could not have been more different, after the Syren left, I hankered for a really high-quality valve phonostage that wouldn't give up too much to the Groove+'s detail, speed and pulsing rhythms. And be a bit more affordable too. Well, Graham promised he was working on something. By the London Heathrow show, it was ready. It's called the Seven for export, the PhoNote domestically ("designed for Noteworthy Audio in Aylesbury for the UK market" and down-scaled in parts). 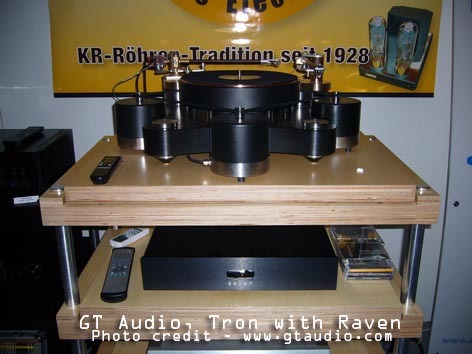 It was strutting its form when on display with a Raven turntable, Schroeder Reference arm and Allaerts MC1B MkII cart. I got it just after the show and in short, the Seven looks like it's exceeding my best expectations. 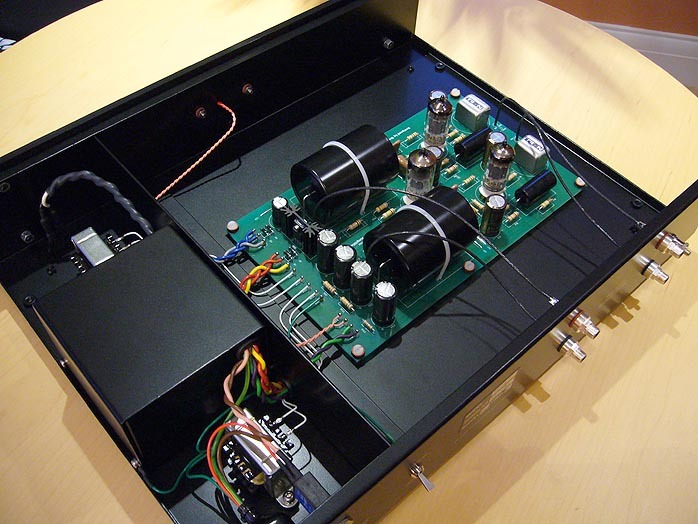 It's a transformer-coupled valve phono using 12AX7s and its gain is factory-set at either 10x or 20x. The 10x version is sufficient for my .1mv Allaerts MC2 Finish (yes, amazing, isn't it?). In fact, it's something special and without wanting to prejudge what follows, all I can say is that I'm convinced that what we're seeing here is a true star being born. In New York, people have apparently already gotten wind of the qualities of this phonostage. Three units were sold last Thursday alone and Graham is building them as fast as he can. So if you're in the market for a "relatively" affordable valve phonostage, don't be put off by its lack of regulation. Time to cancel any non-emergency meetings and get down to your local Tron dealer to see what you think. I belong to the school that believes the phonostage to be the key stage of amplification and therefore a pretty key issue in the whole system. The difference between a really superb phonostage and simply a good one is the difference between a truly revealing and involving musical experience and a reproduction. A high quality phonostage is essential if one wants to hear the ways in which vinyl is superior to the best digital players available today. If, like me, you're also keen on valves, finding a good and relatively affordable valve phonostage is by no means easy. 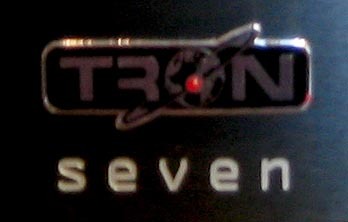 The Tron Seven certainly tops my list there and might even be the only contender I can think of. 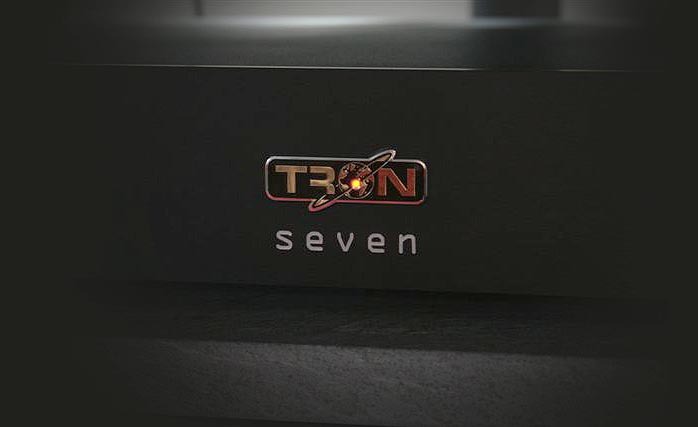 The Seven is a stand-alone phonostage designed to offer a high level of performance at its price. 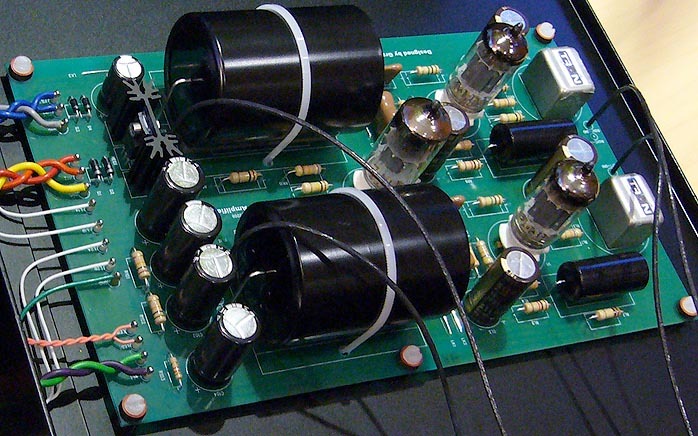 The circuit is a development of the Syren's phonostage. Everything is new inside including the circuit board, audio components, power supply and metalwork. It's quite a large box, 17.5" wide x 13" deep x 3.5" high, with a 6mm thick black anodised fascia. Round back it sports silver RCA sockets spaced widely apart (excellent) and a useful ground lift switch. The power switch is located underneath the unit at the front. It's small and a bit of a fiddle to get to if you're fat-fingered like me. However Graham tells me that on new production models (October 06 onwards), the switch has been moved 10mm further forward so apparently is now easier to operate. Inside the workmanship is exemplary as with all Tron products. Build quality isn't quite comparable to the superb Syren though still excellent at its price. The case is painted with a special paint of a textured finish chosen for its damping proprieties as well as high durability. The case has also been designed for maximum shielding from both inside out and outside in. The U-shaped chassis base forms a very large ground shield. The rotated U-shaped top section is earthed near to the chassis star grounding point so the whole case becomes an effective Faraday shield. The fit isn't fantastic and if I was lucky enough to own one, I'd be tempted to try dampen down potential ringing between the two even though Graham believes this is not necessary as the circuit boards are rubber mounted to prevent any microphony and reduce vibration-induced problems. There's also a lot of extra space around the circuit board, designed this way to keep magnetic induction to a minimum. 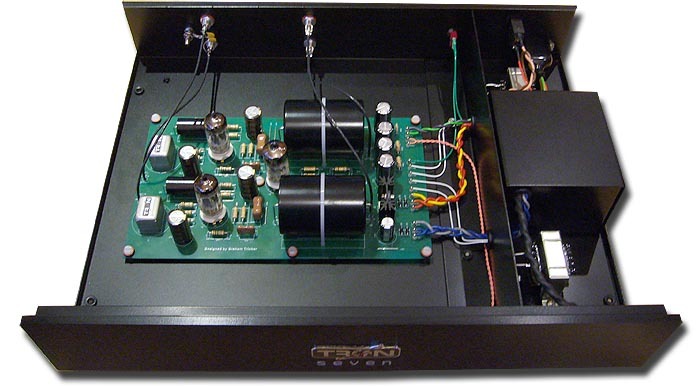 There is a good steel barrier between the board with its valves and circuitry and the transformer and power supply. The mains transformer is further shielded from the circuitry by a specially designed steel case, which is also decoupled from the main chassis. All cabling is PTFE insulated silver-plated copper including the custom made signal leads, which are made to Graham's own specification. The cables disappear through the boards where the shielding is soldered directly to the ground plane thus further reducing induced noise - important when you are amplifying such small signal levels. I was particularly interested in the Seven because I had been told that it was capable of working with my Allaerts MC2 Finish. This is a seriously good cartridge but something of a prima donna. Among its quirky attributes is being a moving coil with an ungenerously stated 0.2 mV output (though some believe it to be even lower) that wants to be loaded pretty exactly at 845 ohms. Which means a lot of transformers don't work well with it and Jan Allaerts doesn't really seem too enthusiastic about using transformers or valves with his cartridges. But if you're a valve aficionado, you hanker. Enter the Seven. Graham sent me one with the correct load and I was in business. Or actually I wasn't. The first half hour was one of the most shut-in and muddy musical experiences of the year. I doubt the unit was run in much but it actually sounded embarrassing for a couple of days. I had a friend round who had bought a Syren based on hearing it here last year and we were both raising eyebrows like giraffes. Frankly I was half tempted to call it a day and send it back. But what the hell, persevere. And slowly, over the next few days, the beast began to wake. And wake it did. (On this subject, this unit had to go off to the Munich Show and when I got it back, it again sounded appalling for the first few hours. So if you hear one that sounds bad, either it's not run in or it's been travelling). It also needs a good half hour switched on before it gets into its stride, worth thinking about if you want plug and play practicality. Hum is minimal and turning up the volume will give you valve hiss rather than hum. It's possible to get lower noise valves but the hiss isn't an issue at all, it's only when you turn up the volume to a point that would have the speakers jump out of their skins that you hear it. When it found its voice, the Seven proved to be a genuine star. Think Pavarotti. Full bodied but capable of considerable subtlety and nuance. Great authority yet somehow also capable of tenderness. Rich in timbre but never overblown. Right off, it throws a huge soundstage with excellent retrieval into the rear of the soundfield. Proportions are correct. Timing is excellent. Bass has unusual weight, wallop and presence for a valve unit. The soundstage is wide, deep and well proportioned. The unit is operating up there with the best of them. While it's been in residence, I've had several phonostages here but the comparison with my Tom Evans Groove Plus was the main issue. This latest iteration of the Groove Plus (with Lithos 7 regulation) is the most revealing phonostage I've come across. It picks up details with an uncanny sense of 'thereness'. It also has a weird ability to make you feel like you're surrounded by the music, almost inside it. Plectrum strokes are stunningly real. A guitar note will take shape in space in front of the speakers with a body and harmonic envelope that is just simply outrageous. Tonally it belongs to the cool end of the spectrum and its surreal transparency is coupled with an almost spectral presentation, which can be unforgiving with some cartridges. It's pretty much the polar opposite of the traditional warm, blousy valve phonostage and I do prefer its sound coupled with valve pre and power rather than solid state. The Seven sits in the middle, being neither warm nor cold. Instead, if the Groove is a crisp white wine, the Seven is a full-bodied red, full of texture and lovely aromas. The Seven is also a more consistent performer than the Groove Plus. Once it's warmed up, it will deliver its goods time after time. The Groove is more vulnerable to grunge up the electrical stream and when that's bad, it will have an off day and can sound harsh and glary. I've tried changing power leads but because the Allaerts cartridge is so delicate, it's important to allow the Groove Plus two hours after switch off/on before plugging the cartridge in, by which time the problem may have gone. I've also tried ferrites on the lead between power supply and phonostage but that doesn't do the trick. The Seven's strengths are those we know from good valve topology. There's a hugely seductive three-dimensionality, a holographic quality that even the Groove Plus can't quite muster. While it won't bring those pesky individual guitar notes quite into the room like the G+, it's got fabulous rhythmic drive and propulsion. The relationship between timing and body, between initial transient and the harmonic body of the note is perfectly judged and above all can be incredibly involving. To my surprise, the Seven emphasises the lower frequencies a touch compared to the Groove Plus, making a sound that is fuller bodied though it doesn't have quite the highs or the see-throughness of the Groove. It can get overwhelmed by excessive bass power but only on torture tracks like Peder af Ugglas' "Autumn Shuffle" on the same album [Opus 3]. It will not separate instruments as clearly as the Groove Plus, more noticeably when there is a mass of overlapping sounds in the bass and lower mid region. Complex passages like massed strings can become a bit clumped together but I only noticed this at a point where the wonderful Mullards I'd had were no longer in situ and a valve change might easily solve that. The Groove is altogether less forgiving and skeletal. That can be useful as a way of really dialing in the cartridge and its so revealing that it forces you to look at everything in the system to get it to sound right. When it works though, it's giving such a close-up picture that it becomes hard to let go of. It's like a very clear stream. The Tron isn't digging as deep though I feel it's deep enough for anyone's purposes. It will inevitably sound a bit murkier and a touch slower. But the quality of sound is lovely and euphonic. You don't get the sense of massed vibrations quite as much but the way it articulates on a rhythmic level and in terms of tone color and over all balance, is very seductive indeed. Dynamic response is really excellent. It is a lithe and supple phonostage. The most telling characteristic however is a 'richness' of sound, rich in heft, power and tonal color as well. These comments are generalizations but remember they only apply to the two phonostages playing the Allaerts. This cartridge is known to be a very high hurdle for phonostages and that the Tron performs so magnificently with it is quite a feat to start with. I wouldnt be surprised if it did even better with a less demanding cartridge. On Webster's Atmosphere for Lovers and Thieves, the Tron reveals a breathier side with the blowing column of air. The G+ instead gives more detail and the vibrations of that column are a bit more fore-grounded. The percussions will be a bit more starkly etched, with a bit more slam and ring to them while the overall presentation will come across as a bit lighter and starker. The G+ seems probably a bit more 'accurate' and the Tron a bit more 'beautiful'. In fact the G+ can seem a bit more aggressive at times in comparison, while the Tron doesn't come across as bland. Paradoxically, while the Tron has less detail, in some ways it appears to deliver a bit more tonal color. And while the Groove has fantastic detail and it's not that the tonal color is significantly less, its just a bit less 'various'. The spray of reverberations on a high hat really is room filling with the G+, while the Tron seems to have a wider soundstage in all and each instrument takes up more space and you kind of loose yourself in it but you don't quite get as 'live' a sensation from the hat itself. Overall, the G+ sounds live and the Tron enveloping. The soundstage probably isn't bigger but it seems to take over the whole room in a strange way. Maybe each instrument is a little bit less focussed or beamy so the energy patterns are spreading out more widely. If I had to make the choice between the two stages, I'd work up quite a sweat. If you want to get as close to live sound as possible, I'd go for the G+. On the other hand, if you want music as pleasure above all, I'd be awfully tempted by the Seven. Considering its price, that is a seriously impressive achievement. I was primarily interested in the Seven for the Allaerts but also tried it with the Koestsu Urushi where even if the loading was wrong, they still got on like a big house on fire - a palace blazing in fact. On the Garrard 301 with the Cartridge Man's Conductor Arm, they instantly became great partners, displaying unbelievably quick dynamics and color: real music. Fabulous.